Animal activist Jane Goodall collaborated with Disney on the new movie “Chimpanzee.” The film tells the story of an adorable chimp named Oscar who is left orphaned after his mother is killed. Filmed in the wild over a four-year period, documentary cameras were poised waiting for anything to happen within a large family of chimps. Something amazing did happen, as ‘Oscar’ was suddenly alone and an older male chimp decided to raise the baby himself — a rare occurrence. The children’s tale is narrated by Tim Allen. But it may be too scary (Remember Bambi?) for sensitive tykes during the scene involving the death of the mother. If you do want to see the movie, be sure to purchase tickets for opening week, April 20-26, 2012. Proceeds during the first week will donated to the Jane Goodall Institute to protect wild chimpanzees. 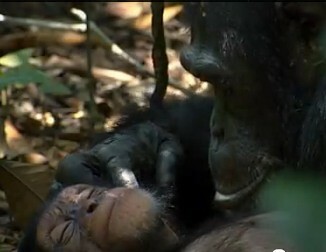 Learn more about the movie and endangered Chimpanzees on the fillm’s website.